Hanging ornaments on a Christmas tree can be fun even when learning is involved! 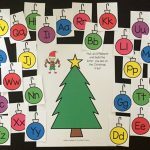 Our Christmas tree cvc word match printable activity is perfect for those new readers who have mastered letter sounds. 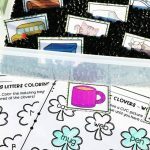 Practice short vowel word work in the classroom or at home with preschoolers and kindergarteners. 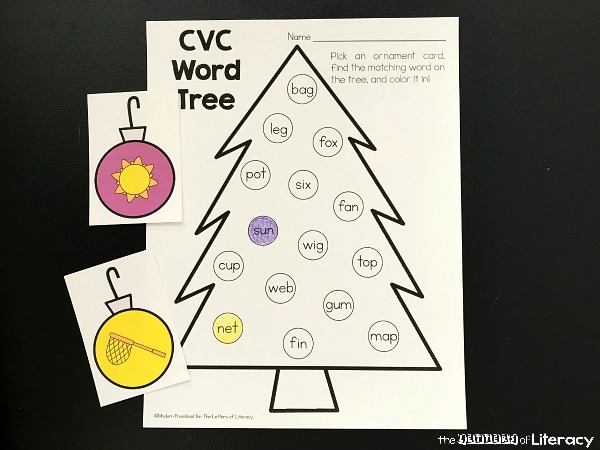 Our Christmas tree CVC word match printable activity can be downloaded from the file at the end of the post. Print the recording Christmas tree sheet and the set of 15 ornament cards. 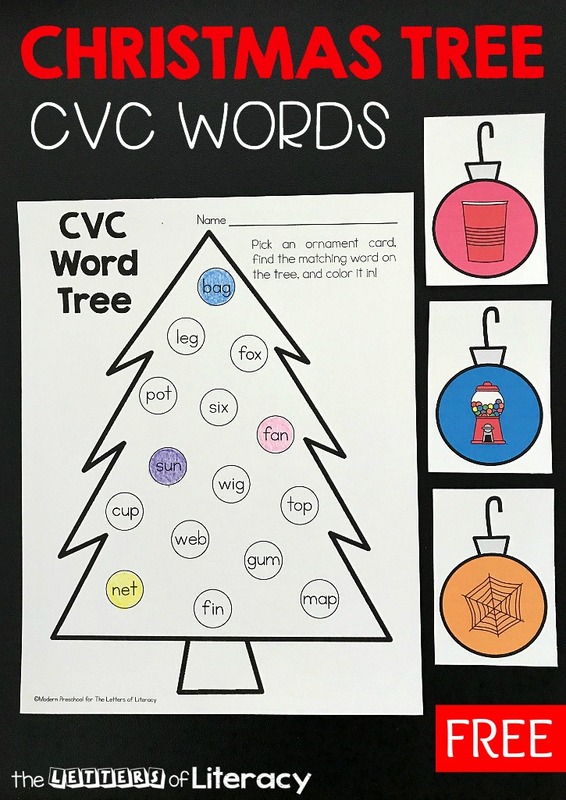 Each ornament card has a picture of a CVC word on it. 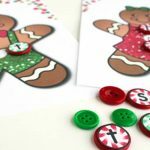 Easily prep the printable activity by cutting the ornament cards apart on the gray dotted lines. Set them in a basket. Make copies of the recording sheet. Add crayons and it’s time to play and learn! 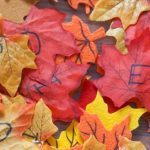 I find that introducing activities like this in my own classroom as a whole group makes it easier to work with the activity in small groups. 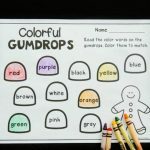 I go over the basic directions, over-exaggerate non-examples, and give my preschoolers the idea of their expectations as they come to the table to work. It’s also important to go over each ornament card so that the children understand what each picture is. To play, pick an ornament card from the pile. Identify the picture on it. Find the matching word on the Christmas tree and color in the correct ornament. Pick another card and play again until all cards have been picked and all ornaments have been colored in. 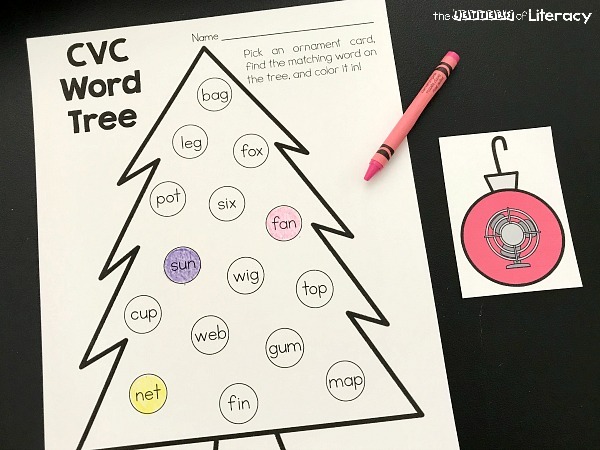 To make the Christmas tree CVC word match activity self-correcting, write the CVC word on the back of the ornament card in pencil. This helps when no teacher is available to work with the group at this particular center activity. 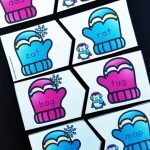 A great way to reuse the ornament cards in circle time is to play a rhyming game with them. 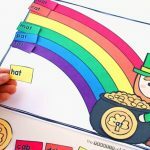 Young children have an easier time rhyming simple words without many syllables. CVC words are perfect for this! 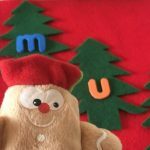 There are so many ways to practice CVC words, but this one is perfect for December! 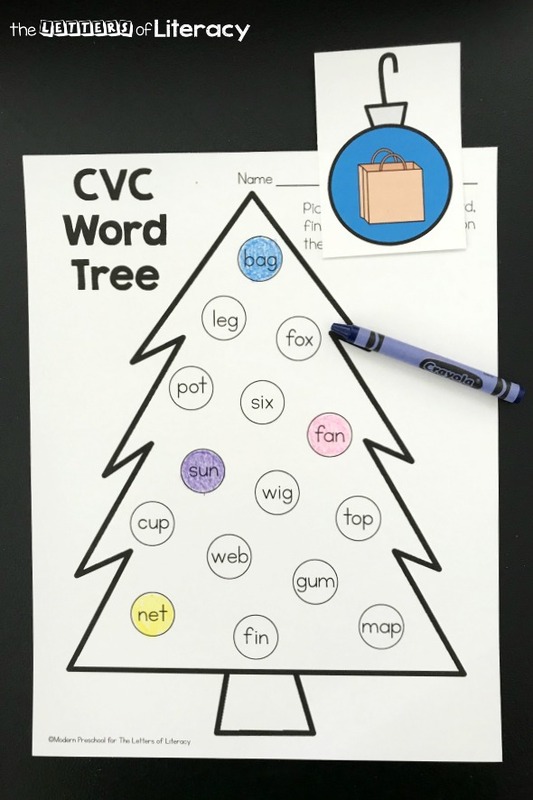 Ready for some Christmas tree CVC word fun? Grab your copy of the CVC word match by clicking the blue button below. 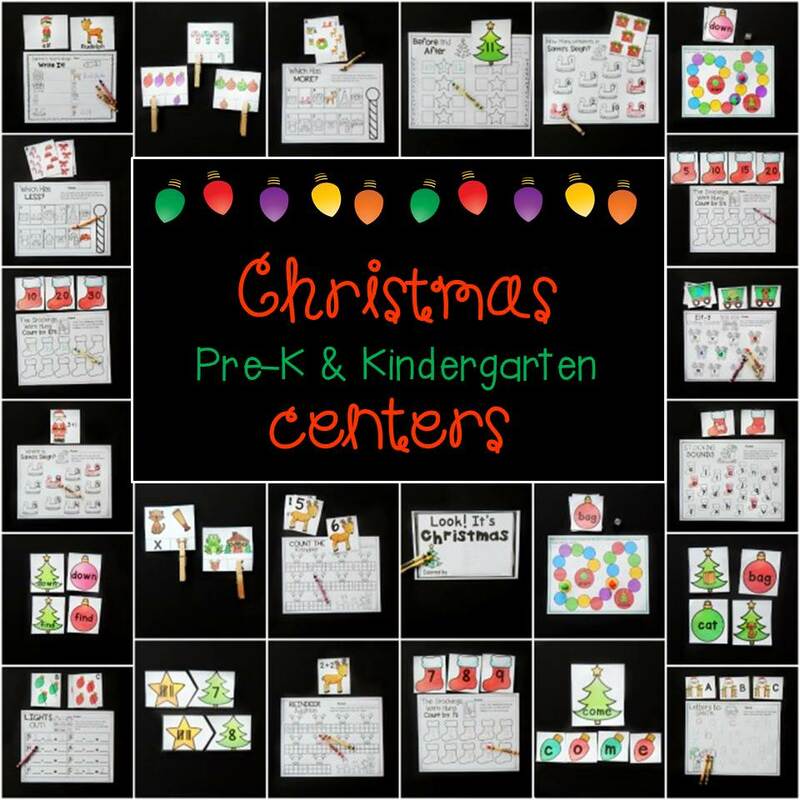 Then, for tons of Christmas fun all planned for you, hop over and grab our Christmas math and literacy centers!